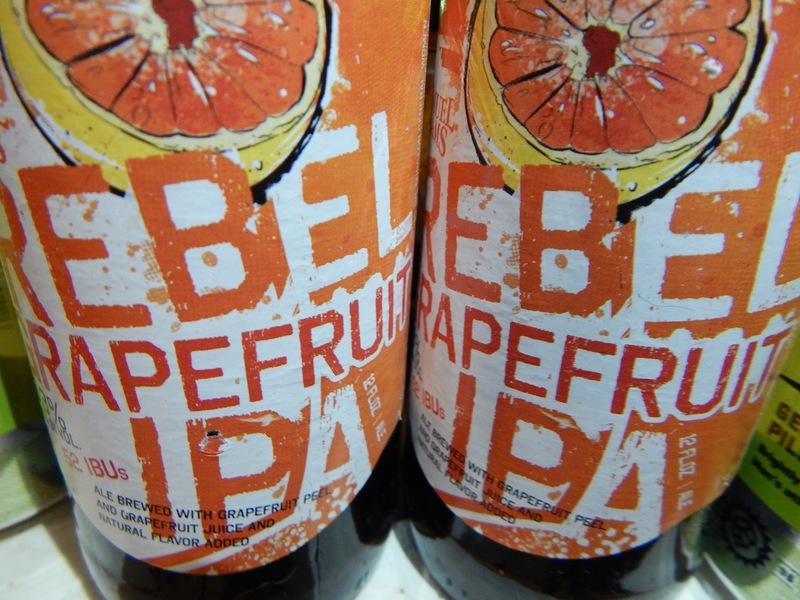 Brewing a fruit IPA is no more difficult than brewing any fruit beer. The most popular fruit IPAs use fruits that either accentuate the citrus character of their hops (grapefruit IPA, blood orange IPA) or the tropical character in hops (mango IPA, pineapple IPA). See below for a list of hops with these characters. 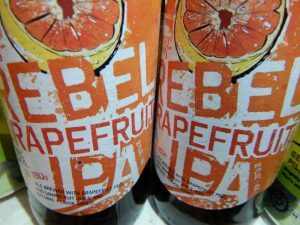 The best examples of fruit IPAs have enough fruit character that you can tell it’s not an ordinary IPA, but not so much that the underlying beer is totally obscured. As such, you really don’t need to alter your IPA recipe to accommodate the fruit — just decide how intense you want the fruit flavor and add that to the recipe. 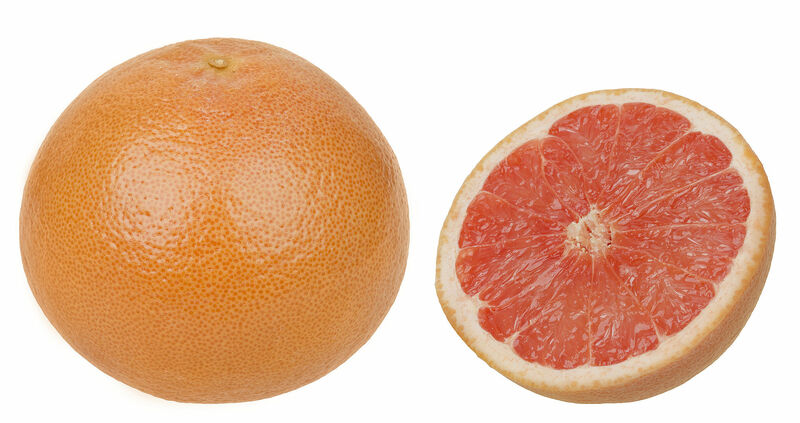 The fruit gets added either as the peel, in the case of grapefruit or other citrus fruits, or as the flesh, or both. You can use fresh fruit, fruit purée, or 100% fruit juice. Citrus peels should be added in the final couple minutes of the boil. They will add the oils from outer peel and potentially some bitterness if much white pith is added with them. Bitterness from the pith won’t be very pleasant, so avoid adding too much of it. Adding 0.25 oz. (7.1 g) of fresh citrus peel per 5.0 gallons (19 L) will add a slight amount of flavor and aroma, on par with a witbier. Adding up to 2.0 oz. (28 g) of zest per 5.0 gallons (19 L) will give a lot more flavor and aroma. Somewhere near the middle of this range would be a good starting point if you’re looking to brew a citrus IPA on par with most commercial versions. Adding citrus zest will have no effect on the original gravity (OG) or final gravity (FG) of your beer. Fruit flesh — with from whole fruits, purées, or fruit juice — can be added in secondary. Add the fruit to a sanitized bucket fermenter,and rack the beer onto it near the end of primary fermentation. The usual rule when brewing fruit beers is to use 1.0 lb. of fruit per gallon (110 g/L) for strongly flavored fruits (such as raspberries) and 2.0 lb. per gallon (220 g/L) for milder fruits (such as cherries). Following this rule generally yields a beer with a moderate level of fruit flavor. 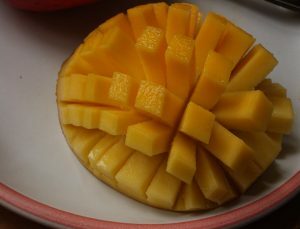 In the case of tropical fruit IPAs, such as a mango IPA, around 1.0 lb. per gallon should give a reasonable amount of flavor. Adding fruit will add some sugar to your fermenting beer. However, it will only add simple sugars — such as glucose, sucrose and fructose — that are 100% fermentable. As such, if will not effect the FG (or body) of your beer, but it will boost the “virtual OG” by a few points. Let the beer ferment the fruit sugars and contact the fruit for 7–10 days,then rack away from any fruit sediment to your keg or bottling bucket. Brewing a fruit IPA is straightforward and requires no new techniques beyond those used in brewing any fruit beer. Since a strong fruit flavor is not wanted, it does not take much fruit to brew one. And, given that some fruits can be added in secondary, it’s always possible to do a batch that gets split after primary fermentation — part gets kegged (or bottled) as IPA and the rest gets made into a fruit IPA. 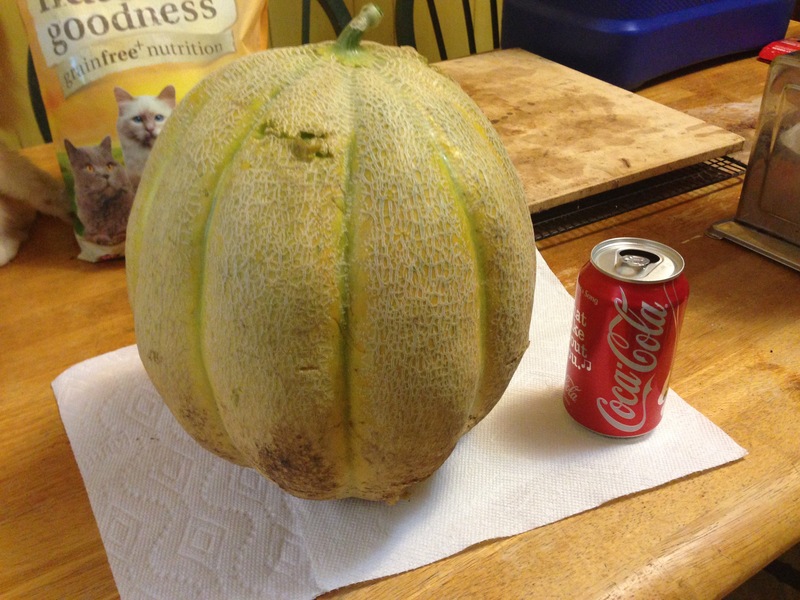 I grew this 13 lb. cantaloupe in my garden. This has got to be one of the worst styles to come around in many years. It tastes like beer flavored fruit juice. I’ve tried a few and some fruit and IPA combos just don’t work. Others are OK. In any case, I’d rather just have a regular IPA 99% of the time. Try the 21st Amendment Blood Orange IPA and you might change your mind. Excellent beer! 2 oz. is actually 57g (56.7 if one is being pedantic).